Dr. Mark Amsbaugh specializes in radiation oncology with an emphasis on tumors of the central nervous system, lung, head and neck, prostate and breast. He has experience in multiple radiotherapy delivery techniques including radiosurgery using the Leksell Gamma Knife®; stereotactic ablative body radiotherapy; image-guided and intensity-modulated radiotherapy; and high dose-rate brachytherapy. 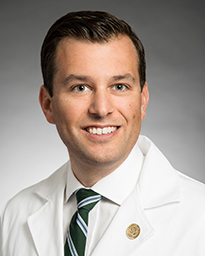 Dr. Amsbaugh earned his medical degree at McGovern Medical School at UTHealth and completed residency training in radiation oncology at the James Graham Brown Cancer Center at the University of Louisville, Kentucky, where he served as chief resident and president of the University of Louisville House Staff. He completed a clinical fellowship in radiation oncology at The University of Texas MD Anderson Cancer Center in Houston. Dr. Amsbaugh has authored numerous articles and has published in peer-reviewed journals including Head and Neck, Journal of Neuro-Oncology and Cancer. He is the author of several book chapters focusing on the treatment of brain tumors and radiosurgery. He has given invited national and international presentations on a variety of topics. In addition to numerous research awards, Dr. Amsbaugh has received multiple honors including the Emmet J. Conrad Award, The RSNA Roentgen Award and the University of Louisville House Staff of the Year Award. Physicians affiliated with Mischer Neuroscience Associates engage referring physicians in the care of their patients, keeping them informed about patient progress throughout the evaluation and treatment process. After a patient’s treatment, referring physicians receive a summary and a plan for follow-up. They encourage continued communication about each patient. Mischer Neuroscience Institute at Memorial Hermann-Texas Medical Center extends its network of care across the Greater Houston area, bringing neurological and neurosurgical expertise to patients throughout the community via Mischer Neuroscience Associates (MNA) clinics at Memorial Hermann. To refer a patient, call (713) 272-1360.